when you needed a large, hulking system to perform all of your computing tasks; now your latest smartphone or tablet, that you carry in your pocket, can do most of them! Desktop computers are no more the craze as they are already fast enough and overall, focus has shifted toward convenience, efficiency and smaller form factors. Under these changed circumstances, all the major players in PC market now have realized the importance of having a solid and effective mobile strategy. Nvidia has long joined the ARM camp and now a major provider of smartphone and tablet SOCs with its Tegra line. Intel has been trying to make headway into the mobile sector for some times now with little success, but finally the giant chipmaker seems to have a rather competitive product in its hands in form the new Medfield SOC. Microsoft has partnered with Nokia to deliver Windows based smartphones and is expected to push things up even further with its upcoming Windows 8 launch. 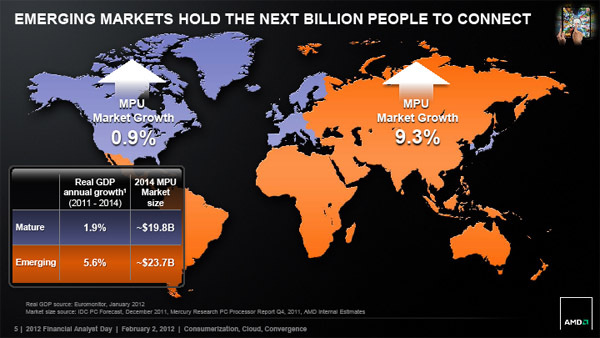 AMD meanwhile lacked a steady mobile strategy in recent times. The company currently doesn't have a smartphone chip or SOC to offer and although we've seen tablets based on its Brazos line of CPUs - its market share is next to nothing. We expected AMD to address issues like this in it Financial Analyst Day (FAD) and thankfully AMD not only did that but also provided us with many info and updates in almost every front. This year in FAD, it was a completely new team from AMD. As you might know AMD has gone through a big corporate restructuring and as a result most of the top executives are new faces. Company's new CEO- Mr. Rory Read and new CTO- Mr. Mark Papermaster, were among the main speakers and seemed very enthusiastic and confident about future success of the company. Sometimes change is good and hopefully that's the case here with AMD! Anyway, there were lots of slides, stats and roadmaps shown in the event and some of those means little to the end user, so we should concentrate on the important ones. It was pretty clear that AMD think-tank has identified weak execution to be the reason behind companie's recent lackluster performance and we totally agree with it. It was poor execution from AMD that led to the disappointing launch of Barcelona and most recently Bulldozer. So now AMD want to have put a greater deal of emphasis on better execution of products and technologies. Outing from the company documents- AMD wants "Agile Delivery of Industry-Leading IP to the Market". Agility is one thing AMD has been missing as often it has been late to the market. 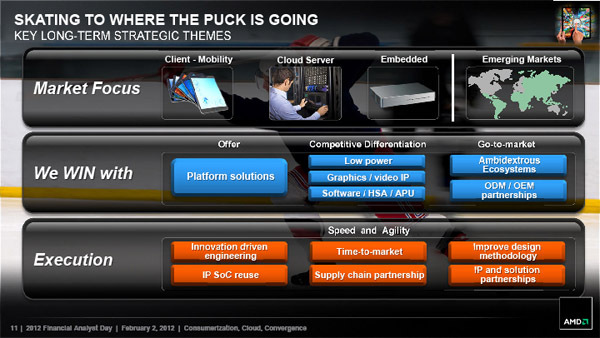 Also a more agile AMD would react faster to the ever changing market needs with faster to-market speed. The take here is- if true to the promise, we can expect AMD to launch new products much faster and without the usual delays that seem to be associated with almost every AMD launch. So far so good! Apart from better execution, the interesting thing is that AMD would be focusing more resources into the emerging markets such as - China, India and South America, where the market is still immature and has plenty room for growth. This is a very good idea since most of the traditional big markets in Europe and USA are becoming more and more saturated. Also AMD's market share isn't good enough in these areas, a stronger, region specific focus would improve the situation. Unlike USA or European countries, traditional computing devices such as desktops or laptops still sell well in these parts and would continue to do so in future. This is smart move by AMD and should help offset the recent decline in sells of desktops/laptops in more mature markets. Next up is APU and it's obvious that AMD is depending a lot on success of these chips. According to the company it has shipped 30 million APUs till date and that's not surprising as Brazos has been the chip of choice of many notebook/netbook OEMs since its inception. AMD wants to ride the success of Brazos and Llano and has great hopes on Trinity APUs, which will feature 2/4 Piledriver (an enhanced version of Bulldozer) cores and 2nd generation DX11 graphics. According to the numbers provided by AMD, Trinity would be at least 25% faster than Llano and already has more design wins from vendors. Overall the the focus is on energy efficiency on small form factor devices and scaling up performance in the desktops. Will this strategy work? It's not easy to claim anything right now as the success of Trinty APU will depend on many other things like CPU performance, processor frequency and TDP, but it should be a very interesting chip to look forward. 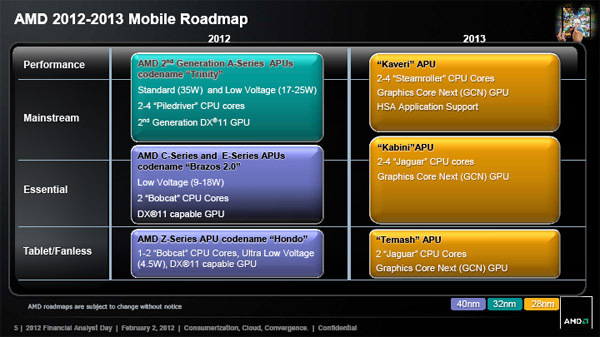 Meanwhile Brazos will have its successor in what AMD calls Brazos 2.0 in 2012. You can recall that initially Brazos was supposed to be replaced by Krishna/Wichita APUs but AMD cancelled those. At this point it's unclear whether Brazos 2.0 will be manufactured in a new process node or use the same 40nm technology from TSMC. Hondo will be the ULP (Ultra Low Power) part targeted toward SOC and embedded devices and should have very low power consumption (<5W). Hondo is also be used in Windows based tablets once it comes out. Mainstream graphics cards has Southern Islands series of GPUs in 2012, which is already introduced. It's no smartphones for AMD however as nothing in FAD suggests that AMD is designing a smartphone CPU/SOC right now. 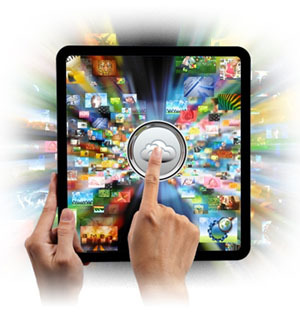 Rather the emphasis is on tablets which seems to be big part of company's future plans. Seeing the cutthroat competition in phone SOC market, it looks like a smart move. It's not easy to get a good footing in a completely different market, Nvidia found that out with Tegra SOC. Tablets on the other hand represent better margin of profit but also have a smaller market. AMD might make a smartphone chip at some point but it's not clear whether it'll be ARM or x86. For now though Intel is the sole warrior for x86 camp in the battle of phone SOCs! The big product launches for AMD will happen in next year. 2013 will see Kaveri replacing Trinity while Kabini and Temash will end up replacing Brazos 2.0 and Hondo respectively. 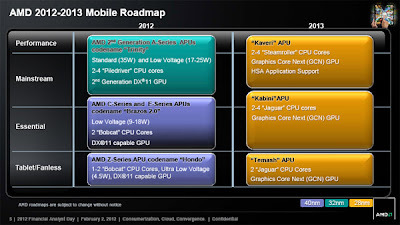 Kaveri APUs will be using 3rd generation DX11 graphics a.k.a GCN. It'll be 2nd gen (VLIW4 based?) graphics in other APUs. It seems like Jaguar will be the successor for Bobcat cores, so AMD will continue with its two fold strategy where the company makes use of two different core architecture for different market segments. Well, to be honest right now AMD uses no less than 3 core architectures for differnt CPUs - Stars (in Llano, Deneb, Thuban), Bobcat (in Brazos) and Bulldozer (in Zambezi FX series), so it'll be one less! This is a stark contrast to Intel's strategy, where a single architecture dominates most of the segments. In 2013 AMD will also deliver a new GPU series, leveled as Sea Islands (Canary Islands according to semiaccurate.com ), which will incorporate a new design. Everything in 2013 will be made in new 28nm process technology and this brings us to the next slide. If you look closely you find that every APU/CPU from AMD in 2012 would be either 40nm or 32nm parts. But Intel is well ahead in its way of transaction into a smaller 22nm node. Intel's upcoming Ivybridge CPUs will be the made on 22nm while Trinity will use the existing 32nm node from Glo-fo. This is where Intel will have a significant advantage by virtue of having its own fabs and manufacturing process as we've discussed in the first part of this article. 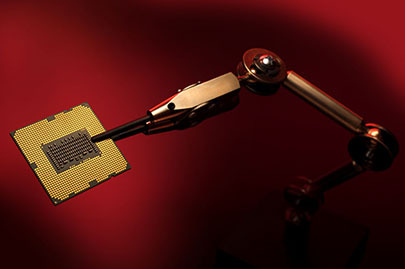 But AMD's dependency on others such as Glo-fo and TSMC for manufacturing its chips is the limiting factor here and won't allow AMD to follow Intel to a similar process node. But in a very interesting turn of event AMD seems to have taken a firm stance in not following Intel's tick-tock cadence. According to senior officials this practice has proven to be "unhealthy" for AMD in the past and instead the company has invented a tick-tock of its own in which it'll deliver a new design every year with increased performance and manufacture its chips in process node that is both practical and profitable. This is a new approach for sure and obviously one derived from a practical point of view. Migrating to new and smaller process node may sound interesting and fancy but in reality it is a very costly, time consuming and tedious work. It demands lots of resources which might not be a non issue for a big company like Intel but for a fabless and much smaller company like AMD - it takes its toll in more ways than one. But what about the ever widening performance gap between both camps? Well, AMD hopes its agile execution,consumer specific product model and "flexible around ISA" approach would help bridge the gap. In short, AMD made it clear that it is not bound to a specific ISA (read x86) in this years FAD. This was the speculation if you recall it and now AMD has confirmed it. This means AMD may very well design an ARM core/SOC if demands be so! Is AMD doing it right now? Surprisingly AMD has not given a clear answer to this question. Only time will tale I guess! AMD will let third parties use its IP and this too is something new. But in a longer term AMD's main differentiating factors could very well be its graphics expertise and HSA. Don't get too much exited though as HSA is not the next Athlon AMD has been looking for! HSA (Heterogeneous System Architecture) is simply FSA (Fusion System Architecture) re-branded. Whatever the name is, the underlying concept remains the same- to unify and combine both CPU and GPU in seamless and efficient way. But this time things are much more organized with a solid roadmap. This, we believe, to be the secret ingredient that AMD relies on to serve its future recipes! Of course there is still a great deal of distance to be covered up but the path seems to be well laid. looking at the road map, AMD's plan is to take a big step every year. 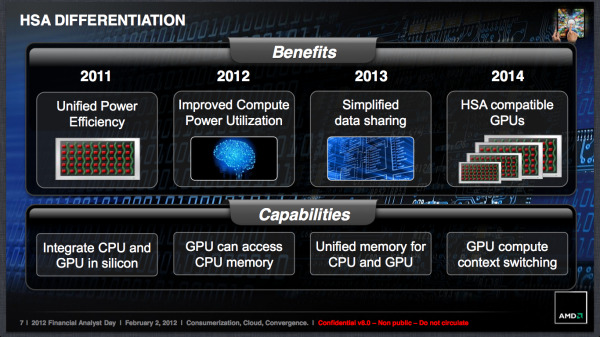 Integration of CPU and GPU in the same die has already been done in 2011 along with sharing the power package. Trinity is supposed to bring in a greater level of integration and optimization this year. Also with GCN in hand, AMD has a much more moulder, efficient and scalable computing solution. HSA consists of both hardware and software optimization, using standards like OpenCL. An ISA agnostic heterogeneous computing environment could be the holy grail for GPGPU enthusiasts but surely it'll not be an easy target to achieve. But at least AMD seems to be well poised to take things to a new level. If things go accordingly we might soon witness an APU invasion into the servers! In Theory, most highly parallel workloads should yield favourable result on a GPU but the key is to distributing workloads efficiently. Will AMD use a special hardware block to determine the nature of loads in its future APU designs? right now it's anybody's guess but we sure will be looking eagerly how things pan out in future. Finally we can say that FAD 2012 was truly an interesting event. We couldn't cover all the angles and might have missed some interesting bits. But we lack both the time and scope to do a more comprehensive article, hope the reader will understand. Coming back to the topic, are we witnessing the emergence of a new AMD? There is no simple answer to that, I'm afraid. There are lots of good things we found in this years analyst day. There is a positive and energetic vibe going on through the company, while we're not sure if it's an effect of recent change in management ranks but may very well be so. The new leadership is enthusiastic, practical and ambitious which is a fine thing. This is the first time AMD has admitted its weakness and promised to work on it. We got some impressive and long term roadmaps from AMD this time and this is one thing we don't expect from them given the past record. But above all, it looks like AMD has stepped out of its former self and rather than playing a foil to its arch rival Intel, now the company seeks to establish a new identity. This is a company that is trying to reinvent itself under difficult and changing circumstances. But then setting up new goals means nothing if you can't achieve the existing ones. 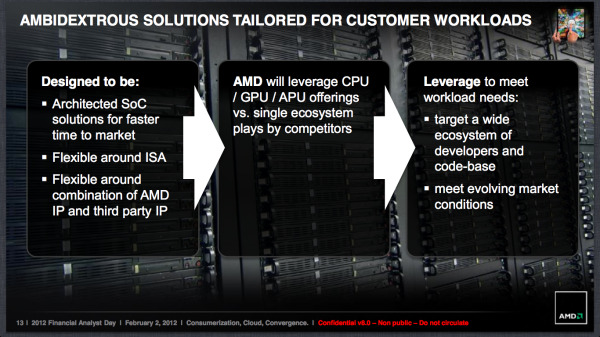 2012 is going to be testing time for this new 'AMD' and execution is the key-word. The potential is there, the will is there and surely we'll be there to provide updates.